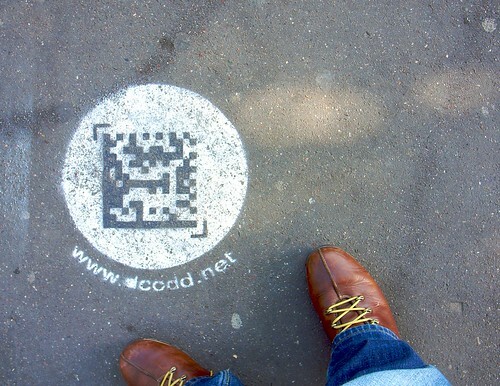 Interesting encounter in a one-day trip to Paris this morning: a visual marker, complemented with a unified resource locator on the pavement of Paris, close to Place de la Bastille. Aimed at mobile phone owners who will surely be led to the url. the presence of the marker in the environment, surely an interesting design issue to be contrasted to representation on posters or marker on magazines (smaller surface that you hand out to other performs, while the sidewalk marker is static. the horizontality of the surface: you have to look at the sidewalk and point it with your phone.